World of Warcraft for the newcomer - This Is My Joystick! World of Warcraft (More commonly known as ‘WoW’), has reached such a high pedestal of achievement in the gaming space that it is hard to fathom any gamer not having at least an idea of what it is. Having passed the 12 million players mark just two short weeks ago, WoW shows no signs of slowing down. However, for those of us who have not played the game yet, that is why this article exists; First of all, to let you know if the game is for you. A lot of people think that a video game can’t be that large of a commitment… That’s downright wrong. Second of all, to send those of you into the game with more knowledge of what to expect than before. This isn’t to say I can tell you everything there is to know about WoW in one article, because that would be heresy; there’s too much to tell. Being that I’ve played the game for a few years now, hopefully my advice will come in handy. This game is a surefire commitment of your time and effort. You’re probably better off buying a workout video regimen and keeping to that, because this game will take weeks or even months of playtime to become proficient at. Bear in mind when I say “Weeks or even months”, I mean weeks or even months. If you didn’t take my advice before and look into a workout plan, then I would actually recommend you to try a different game first. There are many games out there that don’t take near as much time up as WoW does that are also MMOs. You’ll find that many of the players on WoW are people who are only playing because they love the social aspect of it, and I will admit; You will not find a better social experience in gaming. Then there are those of you who just want to get into it and try the game out. This is the group of people who will download the free 10-day World of Warcraft trial that I didn’t tell them about and proceed down the veritable Blizzard assembly line of loyal players. The basis on which the game is set follows, for the most part, the Warcraft RTS (Real-Time Strategy) series of games. Seeing names like Thrall, Arthas, and many others brings back memories that are simply nostalgic. If you value this in the games you play, then Blizzard is sure to satisfy your expectations. For instance, from the moment you step into Northrend (We’ll get to what that is later. ), you will be interacting with Arthas. While he may be turned Lich King at this time, it’s still pretty cool. The World of Warcraft has a good line of races to choose from. The races are split into two factions, each with their own unique cultures. Each race comes with their own different racial ability, and this ability can be used in either Player vs Player (PvP) or Player vs Environment (PVE) combat. While some of these abilities may be more useful than others, I’ll let you decide that for yourself, because I’ve listed the races below as well as their racial abilities and some interesting facts about each one. Humans – The ‘figurehead’ portion of the alliance faction. They are provided with the racial ability ‘Every Man For Himself’. This allows you to break free of any movement impairing or immobilizing effects. This is commonly used in PvP. Dwarves – The short, stout, and all-around gruff little people we’ve become accustomed to seeing in medieval games. They are provided with the ability ‘Stoneform’ that removes any poison affects, and gives a boost to armor. Night Elves – Tall, lean, and agile elves that are granted the ability to ‘Shadowmeld’. This means that you can turn invisible until found or you decide for yourself that it’s time to come out. Gnomes – Even more miniscule than dwarves, these little creatures can turn somewhat annoying (Especially in PvP!). Much like the humans, they are granted with the racial ability ‘Escape Artist’ that removes all movement-impairing effects. However, unlike the human racial, it does not remove immobilizing effects. Draenei - Introduced in the Burning Crusade (World of Warcraft’s second expansion. ), these proud creatures keep themselves alive with the racial ability ‘Gift of the Naaru’. This heals them for a small amount of health, but sometimes that makes all the difference. Orcs – Brutish and strong, this race is the foundation of the horde. They are given the racial ability ‘Blood Fury’, which increases your attack power for a certain amount of time. Undead – As their name implies, these are the undead horrors of the Horde army. Being that they are already frightful enough, they are gifted with the ‘Will of the Forsaken’ ability. This enables them to break fear or other charm effects, which is very useful in PvP combat. Tauren – Large, lumbering beasts that are at one with nature. They use their racial ability ‘War Stomp’ to stun all enemies around them for a short time enabling them to gain the upper hand in almost any situation. Trolls – Lanky, deceptive, and somewhat creepy these blue creatures are one of the most savage members of the Horde. They are given the ability ‘Berserking’ which increases both your casting and swing speed by a certain percentage. Blood Elves – Introduced in the Burning Crusade, these malevolent elves intend to right the wrongs done to them by the Alliance. They are able to silence (Stop spell-casting) their enemies for a certain amount of time with the racial ability ‘Arcane Torrent’. The highest level attainable in the game is ’80′ at the moment. You get there by completing quests and killing monsters for experience. Depending on what race you decide on playing as, that will in turn decide where in the world you start at. Humans start at the human capital, Stormwind. Orcs start at the orc capital, Orgrimmar etc. This brings us to the many areas placed throughout the World of Warcraft. With each expansion the game grows and new places are added for the player to explore. When the first game, ‘World of Warcraft’ was released, you were granted access to the world of ‘Azeroth’. This took you from levels 1-60. When the second expansion, ‘The Burning Crusade’ was released, you were able to explore the world of Outland. This experience took you through the levels of 60-70. Finally, the third and latest expansion, ‘The Wrath of the Lich King’ introduced Northrend. This took you from 70-80. Below I’ve described each area and what you should expect to see in each. 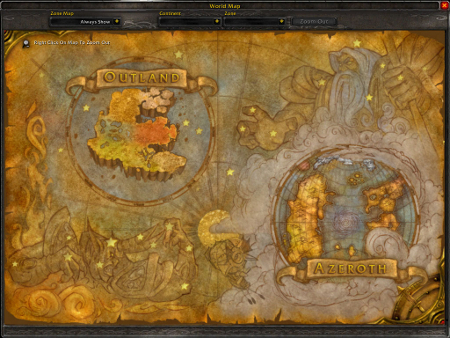 Outland and Azeroth seen from the map view. Azeroth – This world is very civilized as opposed to the Outland and Northrend. You are introduced to each character and class, and you get to learn about the game before you are shown the trials and challenges in the upcoming worlds. Much of the Warcraft’s lore can be found here, and it will offer an extremely nostalgic experience for anyone who was a fan of the RTS versions of the game. Outland – A fair bit strange, this is the realm of Illidan the Betrayer. There is everything from grassy fields to floating rocks and space storms found here. It is by far the most versatile environment you will experience throughout your World of Warcraft experience. Northrend – The frigid land where Arthas has taken residence. Unlike Outland, this is a separate continent on Azeroth. Located near the northern pole, it is a land riddled with the Lich King’s (Arthas) doings. Zombies and dragons walk the face of this land, patrolling for the unlucky hero. Furthermore, the game offers you the option to choose what ‘Class’ you want to play as. Each different class offers unique and powerful abilities to the player, most of which can be used in both PvP and PvE combat. Each class has three different talent specializations, each focusing on doing damage, healing, protecting, or offering you different ways to do damage. Some races are not able to play as certain classes for unseen reasons. In any case, I’ve listed the different character classes below, and what each of them can offer the player in terms of spells and abilities. 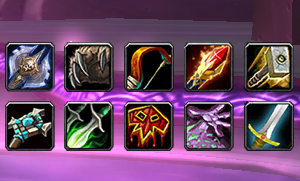 All of the current class icons: Deathknight, Druid, Hunter, Mage, Paladin (Top, Left to Right). Priest, Rogue, Shaman, Warlock, Warrior (Bottom, Left to Right). Warrior – A fearless hero who wields mêlée weapons and plate armor. He focuses on doing large amounts of damage up close, or defending the people around him with shield and sword. Mage - The smartest hero in the World of Warcraft, he uses his expertise in the arcane arts to call upon fire, ice, or magic to damage enemies. Rogue – Quite possibly the most mysterious of the Warcraft classes, this hero fights from the shadows, sneaking up on his prey and expunging large amounts of damage while at the same time controlling his opponent. Druid – These heroes fight by way of shape-shifting. Often cited as a ‘Jack of all Trades’, the different forms this hero takes changes the way the class plays. He can heal, do damage, or even protect a group. Paladin – Heroes of the light, these strong men and women can fight, heal, or protect through their spells and plate armor. Shaman – At one with nature, these heroes call upon the elements to fight with and for them. Having a high damage capacity and a strong healing specialization, he offers a strong support for any group. Warlock – Heroes who dabble in the demonic, they can call minions to fight for them or cast spells to damage the enemy. Hunter - Heroes that focus on staying away from their opponent and raining down arrows or bullets at them. Often seen with a pet, he is a master of ranged battle. Deathknight – Released in Wrath of the Lich King, these men and women once fought for the Lich King but now have found their way to the light. Wielding melee weapons, plate armor, spells, and minions, these heroes are a strong asset to both the Horde and Alliance. Priest - Cloth-wearing, powerful vassals of the dark and light, these heroes use their gifts to strengthen, damage, or heal the characters surrounding them. The folks at Blizzard are set to release their next expansion, ‘Cataclysm’, on December 7th, 2010. Unlike the previous entries to the game, this will not add a new land mass or world to the game, but instead it will reshape Azeroth. The level cap is being increased to 85, both Worgen and Goblin race archtypes are being unveiled, and new professions are all a part of what we should expect in the looming expansion. However, what does this mean for you? It means that if you were waiting to give World of Warcraft a try, that now is the time. You can get to level 80 and prepare yourself for the expansion. I hope this helped some of you decide if WoW is for you, and if so, I will see you in Cataclysm! Are games moving forwards or backwards?